Released: November 8, 2013. Directed by: Alan Taylor, James Gunn (post-credits scene). Starring: Chris Hemsworth, Natalie Portman, Tom Hiddleston. Runtime: 112 min. The main villain of the story is Malekith (Christopher Eccleston) who wanted to turn the world dark back in the Dark ages. This sparked a war between the Asgardians and his Kursed dark elves, and the Asgardians won, burying the Aether (the tool that would enable Malekith to make the world dark) where it would be difficult to find. 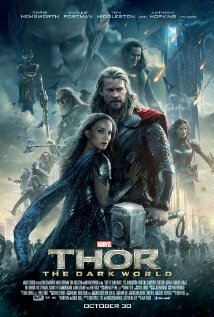 Skip to the present after the events of “The Avengers,” Thor (Chris Hemsworth) is restoring order to the nine realms. He still longs to see Jane Austen (Natalie Portman) once again. Meanwhile, we find Jane back in London, who eventually picks up readings that might be a passageway to Asgard. It’s pretty cool, they find this sort-of vacuum thing in an abandoned building where they throw it down a staircase and comes down from above. The writers have fun with this. Anyway, this all leads to Thor and Jane being reunited, Malekith resurfacing, and Thor setting off on a perilous journey to save the earth. I think Chris Hemsworth allows Thor to be the most charming Avenger, even if I’m more fond of the sarcastic wit RDJ brings to Iron Man. I like the comic relief in these Marvel blockbuster movies, and Kat Dennings is the main source – and Stellan Skarsgård gets some of the biggest laughs, after being relieved from Loki’s mind manipulations. Speaking of Loki (Tom Hiddleston), his role is a bit more complicated this time around because he is the unpredictable wild card here. He is also the main source of comic relief on Asgard. Natalie Portman is still as beautiful as ever and remains one of my favourite actresses working today – and I love it when she reminds me of that. She embraces the heartbreak of being away from Thor from so long, and also the awkwardness of not being able to tell people. One more comment on the cast: It’s great to see Adewale Akinnuoye-Agbaje (“The Bourne Identity,” “TV’s Lost”) as Malekith’s main henchman, as a tough-as-nails Kursed dark elf. Some of the wars that happen are a cool change of pace from the first film because more take place in the nine realms rather than on Earth, with the exclusion of the final battle, which is both entertaining and a bit distracting, and you’ll see what I mean when you see it. The distracting part makes it a bit goofier than I might have enjoyed – but it’s still entertaining. I like the Cambridge University setting, because if that was really true damage to the school, I’m sure students will be happy to have a few weeks off from repairs! The other landscapes are really awesome, and there are some really cool weapons used by the Dark Elves I’d like to use. Especially in a video game. Please? With all the comic relief and simple story, the film has a lighter tone than one’s average comic book adaptation. It still has a good cast and the brotherhood relationship between Thor and Loki is an interesting one because they want to trust each other but they really can’t because Loki is always up to no good, or so it seems. Thor is a noble character who puts the world’s needs, and Jane’s needs before his own. But he doesn’t really have to worry about himself because he has that awesome hammer. This is an entertaining ride, so hop on if it sounds like your type of movie, and if you like humour in your action films. It’s a summer blockbuster treat for the winter months!